<strong>This Tutorial has been created using Unreal Engine 4.9.2</strong> Make sure you are working on the same version of the engine. I won’t use isUnlocked now but it will be needed in later tutorials. Open your Game Instance class and create variable named “Levels” from LevelData structure, mark it as array and add three levels. It’s easy – open your gameplay map and create screenshot. Resolution depends on you. Mine have 200×114. Import the screenshot to content browser and create material from it named M_Level0_Icon. I don’t have enough Photoshop skill so I’m using material to create the icon. Later in development I will update this to simple texture without the material. Now I need border – again this can be added to the texture directly without using material. Again – this can be done in Photoshop without using materials! I will use wireframe material feature for this. Download this asset and import FBX file to Content Browser. I will use early created map for icons which was described here. 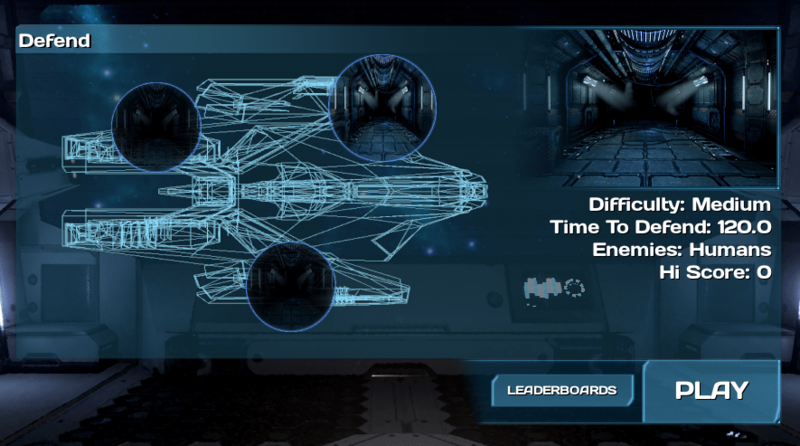 Place your ship in the level assign the material and just create 1024×1024 screenshot. You are ready to go! 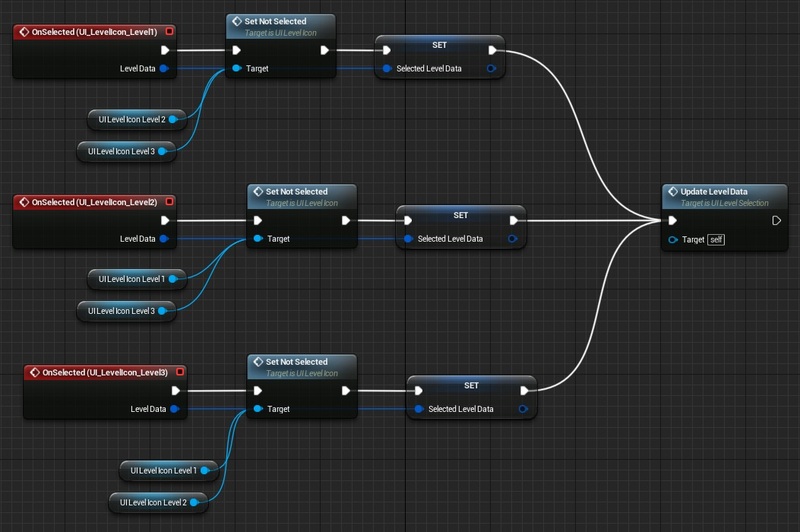 Assign your icon and background materials to Levels array created earlier! For now I have only one level so levels have the same data. Now let’s move to some UMG! Create new widget named UI_LevelIcon. And add Dispatcher named OnSelected with one Level Data structure input. This is searching for level with the same ID in Levels array. If found level with the same ID will store their Level Info for later use. Now the last thing. Manage clicking on the button. 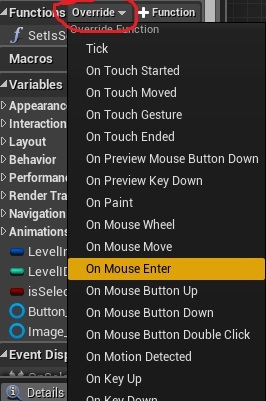 Why MakeDefaultButton is needed? I want to select first level icon when opening the level selection screen. This will call OnSelected as well. I will use knowledge from last tutorial about subtitles. Create new widget named Widget_AnimatedText. It should contain only Text (is variable should be set to true) without Canvas Panel! You should know this already after subtitles tutorial. 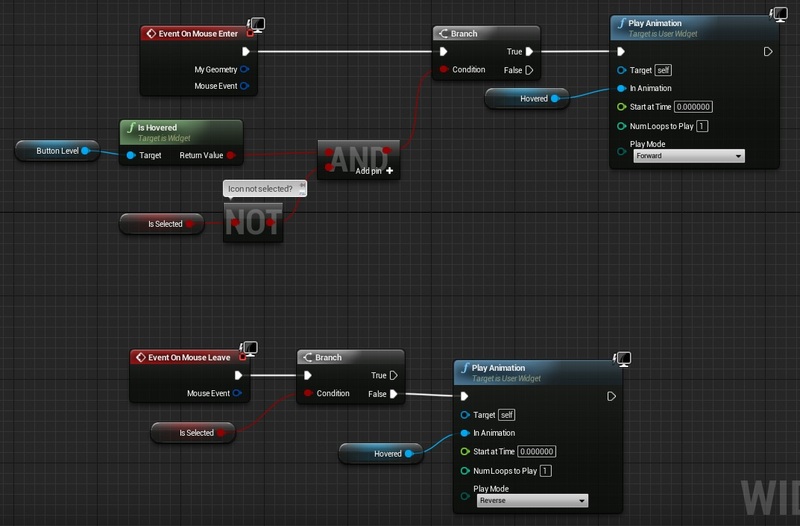 This is just triggering the animation and making sure variables are reset. 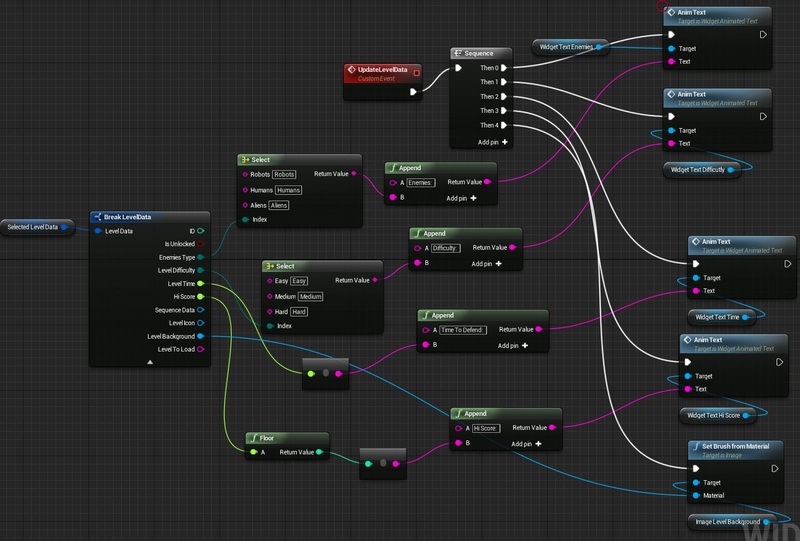 This is taking SelectedLevelData structure information and update all widgets. Triggering text animations and changing background icon. Add OnSelected to all UI_LevelIcon added to Designer. This is getting LevelData from Icon and pass it to UpdateLevelData event. It’s making sure all other icons aren’t Selected. I’m using Screen space because there is an issue in 4.9 with buttons in 3d widgets. Go to Event Grap and add Begin Play to trigger mouse. Place this actor in your main menu level and you can test it out! Ummm… I think you have the wrong link for this page? This is supposed to be the main menu tutorial, however it displays the level selection tutorial. Great series by the way. For anyone struggling to get your compile done in VS after adding the int and bool variables at the beginning – Use uint8, int32, or uint32 instead of int.